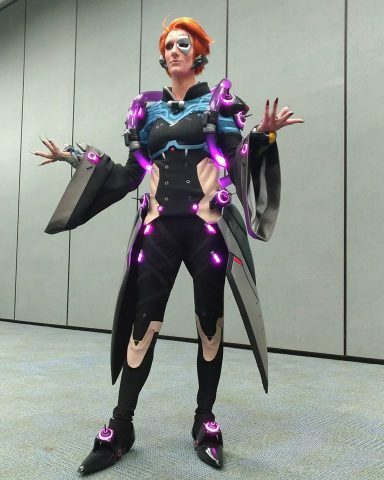 The First Cosplay of Overwatch’s New Character Moira « Adafruit Industries – Makers, hackers, artists, designers and engineers! Cosplay is a big deal at BlizzCon, a convention focused on Blizzard’s games and work. When they announce new characters for their games, it’s only a matter of time before someone puts a costume together — even if the outfit is only based on concept art or a single promo image. 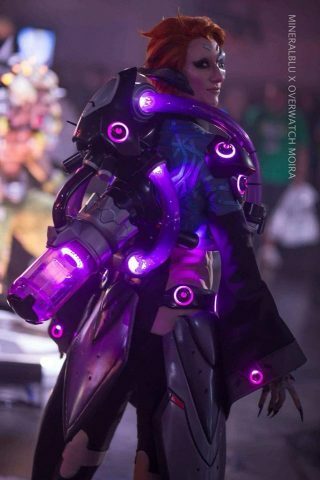 At the most recent BlizzCon earlier in November, they did something cool by hiring a company to make a costume for Overwatch’s new character Moira. They revealed the addition at the convention, but they made the announcement more special by having a model on hand bringing the character to life. Blizzard worked with Henchmen Studios for the costume and props, and they collaborated with Chrissy Lynn on the wig, Keltonfx for the makeup, and Libby Ives Pole Skills for modeling.